Our waiting for the asthma test results is over. I took Tommy to his appointment at 10:30 am yesterday, June 9th, with the pulmonary doctor. When we got there I had to fill out some paper work about our family health history. They did the routine check-up for hight, weight, blood pressure and temperature. All was perfect! The doctor came to the room with a nurse and allergy specialist. They checked his healthy history and they asked me how often he was sick with pneumonia, ear infection or any other health issues before the RSV. Honestly, before the RSV Tommy didn't get sick quite often, just like any other child without the syndrome. A month before RSV he got sick with a diarrhea for about a 26 days, but according to our pediatrician it was a virus that it was around and they had a lot cases like Tommy's. I also heard that other kids at the daycare were having the same issue. But after the RSV, he began to get sick very often. I also mentioned to the doctor, Tommy got a virus with similar symptoms of a virus called Parvovirus, which make our pediatrician worry for my unborn baby because if it was this virus it could cause a lot of health issues to the baby. We did the test for Parvovirus, it came back negative. So we never knew what virus Tommy had. After this virus, Tommy got another virus that make him sick for a week. The last virus he had was two weeks ago, but this time he didn't get so sick. Tommy was also exposed to the company of a dog two days before he showed asthma symptoms, he spray a daddy's cologne on him and we took him to a park when the pollen levels where too high, which all these things together may be the asthma trigers. The pulmonary doctor was taking notes of what I was saying and he decided that an allergy test and a x-ray were necessary. virus he got. It was very itchy! Tommy did great while they were checking his oxigen levels that was 96%, which is good. After they checked him, they did the allergy test. The allergy speciallist was thinking that the test could be positive for allergies. She did the allergy test in Tommy's back, which was a little uncomfortable for Tommy because they were very fine needles. We have to wait for about 20 minutes or so to see the reaction on his skin. When she came back and checked his back, she said: "HE IS NOT ALLERGIC TO ANYTHING." She and I were happy for the results. But I was wondering, What is causing my son's asthma? We went to do the chest x-ray while they got together in other room discussing the allergy test results. After the x-ray, we came back to the room and wait for a few minutes. The doctor came to the room an explain to me that according to the x-ray,Tommy still has patches of mucous on his lungs due to the RSV, but it is nothing we should be worry about it. Tommy's body will get it out by itself. He also mentioned that Tommy was still at the age of high risk for getting RSV in January because he wasn't quite 3 years old; even although, he was a few months to turn 3. The reason Tommy has developed asthma is strictly related to the RSV, which has made Tommy sensitive to virus; therefore, every time he gets a virus he will get sicker than any other child, in other words, it seems Tommy is allergic to virus. Can Tommy's asthma be more sever due to he has Trisomy 21? The doctor says: NO! It is very weird that kids with Trisomy 21 get asthma. Tommy's asthma is a viral asthma as result of the RSV, it is not related to the syndrome. 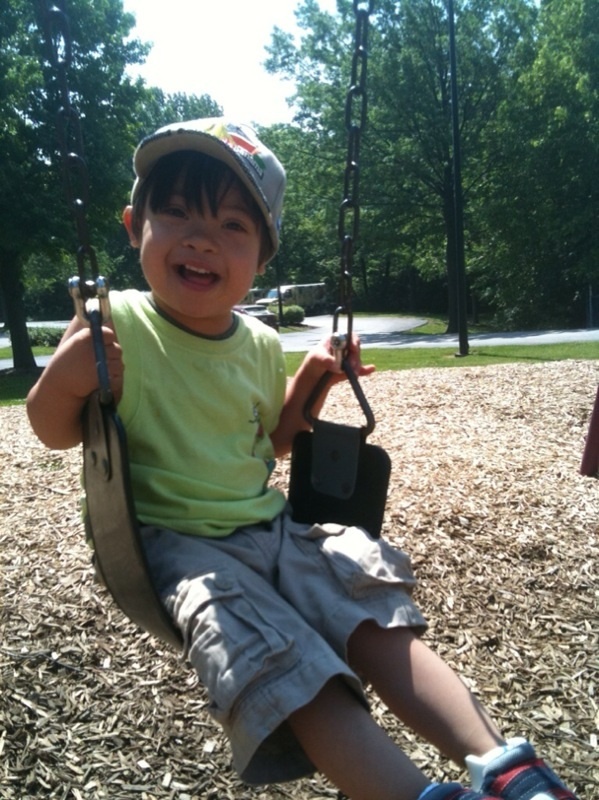 Tommy's case is not different from typical kids that have been through a sever RSV. How to help Tommy to get through the viral asthma? Due to Tommy's lungs are now sensitive they get easily irritated; therefore, we should avoid odors from perfumes, deodorants, body wash, cleaning products, smoke, air freshener, oranges, flowers with strong fragrances, onions, smoke and among others. In other words, we should avoid any strong odors. He is not allergic to the strong odors, but they make his lungs get more irritated, which cause the lungs produce more mucous. We want to avoid as much as we can the mucous because the congestion can cause ear infections and this can cause a lot of trouble in Tommy's language development. Specially now, that he seems more interested to talk. The good news is as he gets older he will grow of the viral asthma. It won't be forever! We also have to give a lot of water to Tommy because it helps to release all that mucous out of the lungs. So I am doing my best to make him to drink water at home because he doesn't like to drink water at home. Good hygiene habit are important to help Tommy, so keeping Tommy's hands clean is other way to keep him healthy. We do a lot of hand wash before meal time, playing outside, touching an animal, and so on. When we are out of the house, we use hand sanitizers in gel and wipes. We also keep a hand sanitizer in his room, so before hugging him in the morning we sanitize our hands. We get used to it since he was a baby. We will just keep encouraging Tommy to wash his hands so when he gets older we don't have to be worried about him washing his hands. I am looking for ways to boost his immune system because it has fight harder and more often with all virus are in the air due to the viral asthma. I will talk to our pediatrician to run a Vitamin Test Profile and/or Nutrient test. In this way, we will know if Tommy is having nutritional deficiencies, which is common in kids with T21 due to extra genetic material their bodies don't absorb all the vitamin and nutrients as it should be. If this way, we can get nutritional supplements that can support and make his immune sytem stronger than ever. without being worried about the asthma trigers.